If you become addicted to iBooks, consider placing it on the iPad Dock for quick access from any Home screen. To do this, press and hold the app ’til all apps jiggle, and then tap and drag the iBooks icon to the Dock. Tap the Home button, and the jiggling stops. Note that any PDF documents you download don’t appear on this bookshelf; you have to tap the PDF Collection to view them (more about Collections later). 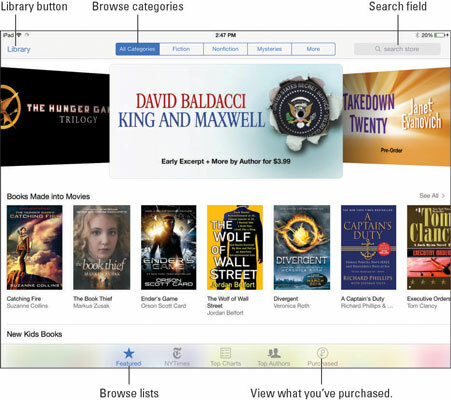 In the iBooks Store, shown here, featured titles are shown by default. Use various links and tools to find the content you want. Tap the Search Store field at the top of the screen and type a search word or phrase using the onscreen keyboard. 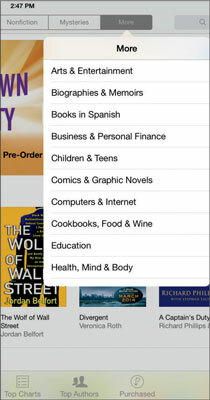 Tap the More button along the top of the screen and scroll down to browse Categories with links to popular categories of book, as shown in the figure. Tap See All to view all titles in a category. Tap the appropriate button at the bottom of the screen to view categories: Featured Books; The New York Times bestsellers list; books listed on Top Charts; and Top Authors. Scroll to the bottom of many screens to access Quick Links, which include shortcuts to Best of the Month, Free Books, and Award Winners. 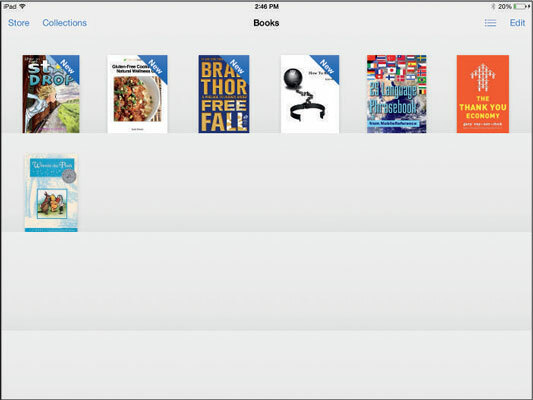 Tap a suggested selection or featured book to display more information about it. To avoid buyer’s remorse, you can download free samples before you buy. You get to read several pages of the book to see whether it appeals to you, and it doesn’t cost you a dime! Look for the Get Sample button when you view details about a book to get your free preview.